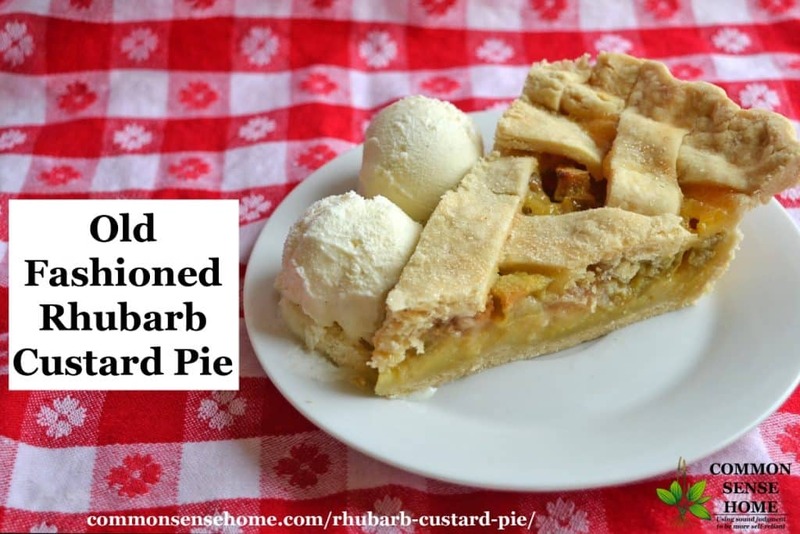 Rhubarb custard pie is a beautiful way to mellow the tartness of rhubarb in a smooth, creamy filling. 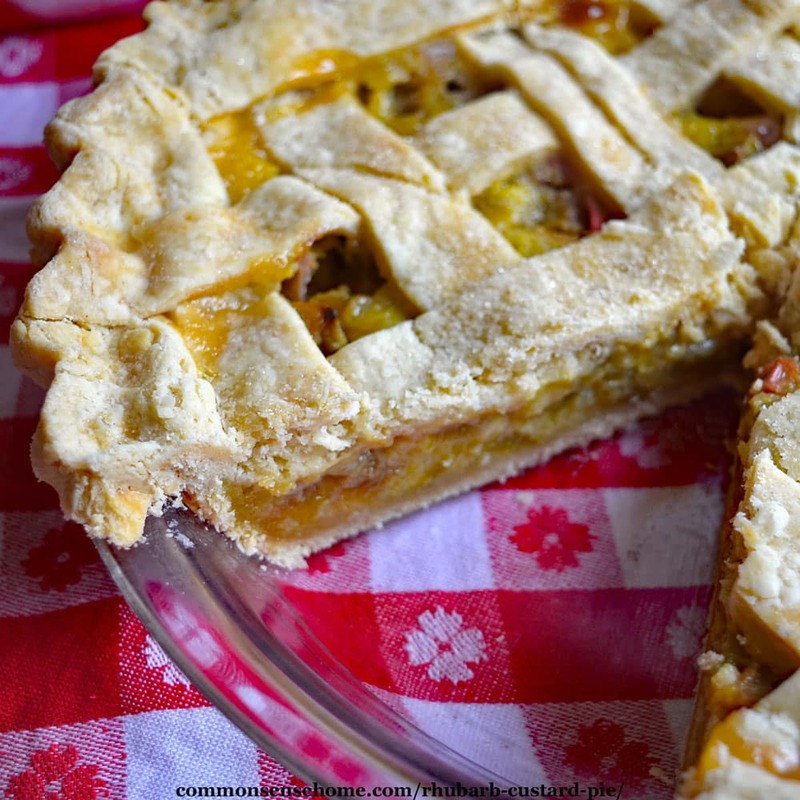 This easy rhubarb custard pie recipe can be made with one crust or two. (Heck, you could even skip the crust and just make the rhubarb custard.) It only has four ingredients in the filling, so it's super simple to make. You may use a purchased pie crust if you like, but I prefer made from scratch pie crust. Preheat the oven to 450° F. Roll out half of the pastry dough. (Keep the dough for the top crust chilled.) Line a 9 inch pie pan with the bottom crust. Combine 1 cup of sugar with 2 tablespoons of flour. Mix in eggs and rhubarb. Sprinkle the remaining tablespoon of flour into the bottom of the crust. Pour rhubarb filling into the bottom crust. Roll out top crust (if desired). Cut vent holes or weave into lattice. Apply to top of pie. Crimp edges to seal. Bake at 450° F for 10 minutes to set the crust. Reduce the oven temperature to 350° F and bake about 30 minutes more or until the custard is set. Cool before serving. Store any leftovers in the refrigerator. Note: If you use cold rhubarb (out of the refrigerator), baking time at 350° F will roughly double. 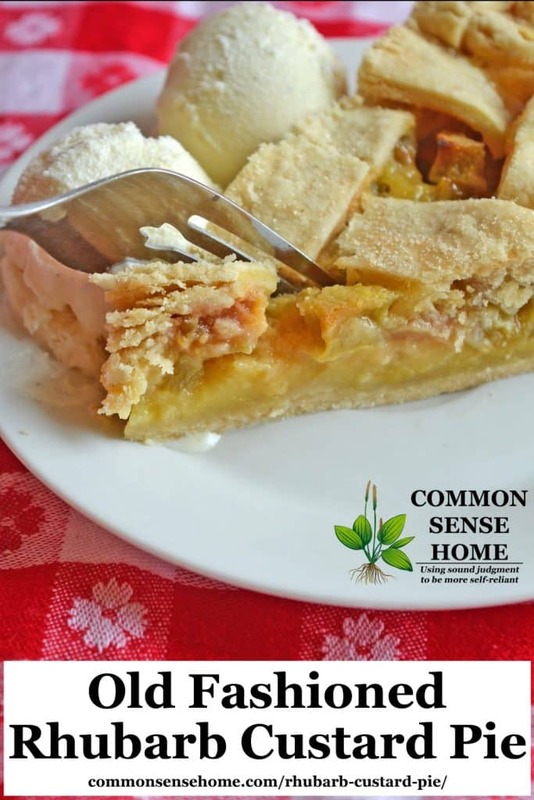 This rhubarb custard pie is a beautiful way to mellow the tartness of rhubarb in a smooth, creamy filling. Preheat the oven to 450° F. Roll out half of the pastry dough. (Keep the dough for the top crust chilled.) Line the pie plate with the bottom crust. Bake at 450 F for 10 minutes to set the crust. Reduce the oven temperature to 350 F and bake about 30 minutes more or until the custard is set. Cool before serving. Store any leftovers in the refrigerator. Cut together flour, salt and lard/butter with two knives or a pastry blender until mixture forms pea size lumps and is evenly blended. Mix together other ingredients in small bowl, blend well. Pour liquid over flour/lard mix. Blend with fork until you can form the dough into a ball. To keep crust light and flaky, do not overwork the dough. Roll out between sheets of waxed paper lightly dusted with flour for easier handling. Dough will keep wrapped in the refrigerator for several days or can be frozen. If you use cold rhubarb (out of the refrigerator), baking time at 350° F will roughly double. You can use a purchased crust, but pie crust from scratch is great if you have just a smidgen more time. My boys generally won't eat pie away from home, because they don't like commercial pie crusts. The “secret” to a perfect pie crust from scratch is to keep your ingredients chilled and work the dough very gently. You want to retain small lumps of fat in the crust, as they will melt during cooking and create air pockets, giving you a lighter, flakier crust. I buy non-hydrogenated local lard, which can be a little tough to find in some areas. You may have more luck at a butcher or ethnic market (many grocery store lards are hydrogenated). Sustainably raised palm shortening will give similar results. Many folks use vegetable shortening, but I don't care for the long list of health risks on that one. I baked this one with Namaste gluten free flour blend and local lard, and it turned out quite well. Gluten free flour tends to be a little more crumbly, so the basket weave top may be tricky for the beginning baker, but it can be done. I prefer cane sugar over beet sugar for more even browning. 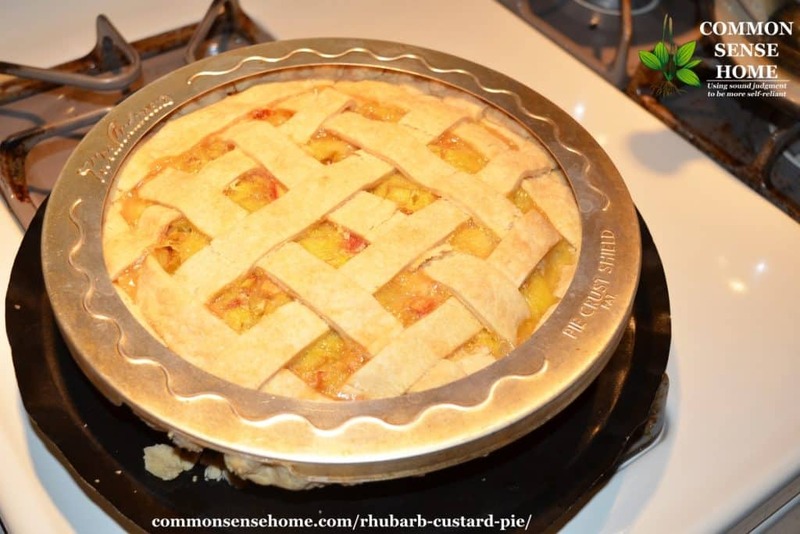 I dressed this pie up with a lattice top for the photos, but as I mentioned above, you can make a single crust rhubarb custard pie by skipping the top crust. My mom always rolled out her pie pastry between two sheets of lightly floured waxed paper, and that's what I do, too. It makes it easier to get a thinner crust and place it on the pie. You should always cut some slits in your top crust to allow steam to escape. When making a basket weave, I first cut the crust into strips. I then weave the strips on the wax paper, and press them lightly together where they touch. I then lift the wax paper and crust together and place the crust on the pie. This keeps the custard filling from getting all over the strips of dough, which is likely to happen if you weave the dough on the pie. If I get enough requests, I will make a video demonstrating how to roll out pie crust. For more pie crust recipes and tips, check out “Best Pie Crust Recipes Plus Tips for Perfect Pies Every Time“. Back at the family catering business, we had a regular restaurant client called the Three Little Pigs. They used to order rhubarb pie every single week from the beginning to the end of the rhubarb season, so I've made a LOT of rhubarb pies over the years. The custard and rhubarb combination is still my favorite. What's your favorite way to eat rhubarb, or a recipe you'd like to see? Leave a comment below and share your thoughts. and our other Made from Scratch Recipes. See The Complete Guide to Growing Rhubarb for help with your rhubarb patch. Originally posted in 2016, updated in 2018. Oh my goodness, I’d forgotten all about rhubarb custard pie. One of the church ladies used to make it for potlucks when I was a mite. Now I want some! But I’ll have to wait until next year because there’s no more rhubarb in the stores here. Unless, I wonder if I could buy it frozen? I’ve never made my pie crust with egg. What is its purpose, I wonder? I’ll post this later today as my pick for tomorrow’s #Recipe of the Day on my social media pages. Thanks for the memories and the recipes! I believe the egg adds extra protein, which makes the crust more flexible and easy to form. Interesting. I haven’t had a problem with my crust being flexible, but it does sometimes go all wimpy around the edge, as I tend to roll it too thin. Btw, I made this pie today, although I discovered too late that a deep dish pie is way too deep for the filling recipe. Yikes! Thankfully, I had some strawberries on hand, so quickly cleaned them, fed them a little flour, sugar and another egg, and filled the pie plate. Delicious! And a hit with my main squeeze. Egg: This makes the dough more pliable and easy to roll out. Eggs also make the crust more compact. Acid and Alcohol: Both acid and alcohol tenderize pie dough, make it easier to roll out, and prevent it from shrinking in your pan. If these things give you trouble, try substituting a teaspoon of the liquid with lemon juice or a tablespoon or two with liquor. Vodka is often used because it won’t affect the flavor of the dough. You can buy It frozen at Publix, was happy to find this out. We live in Alabama and is not widely grown here. The egg, vinegar, sugar, they all add flavor to the crust. I had an aunt that made her pie crust w/ cornstarch, Crisco and water… Least flavored pie crust I’ve ever eaten. A total waste of pie. I love pie crust, but I’ve been spoiled by my grandmother’s pie crust that uses the vinegar, egg and sugar. And is always amazing. 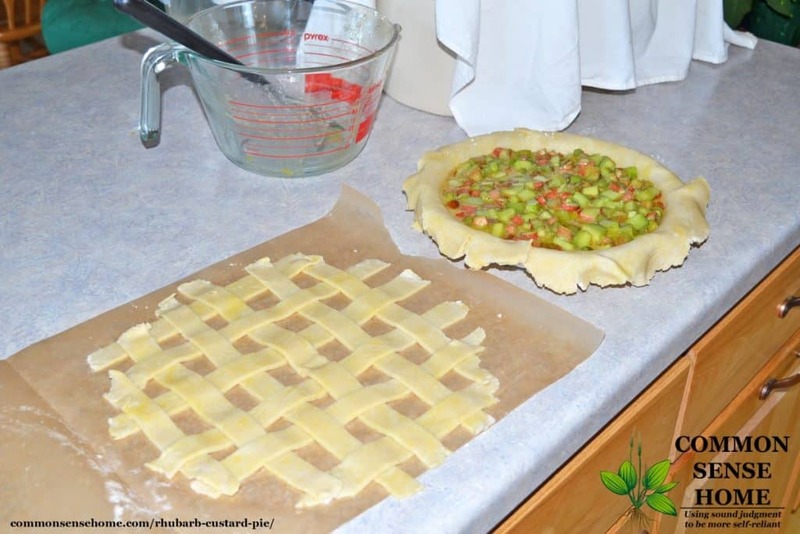 I’ve made lattice pie topping before but not w/ the wax paper… Does it slide right off the paper?? My luck it sticks to the paper!! I lightly dust the paper with flour, so if a regular crust comes off, a lattice should come off even easier. Well, I must try this! My Grandma made a straight-up, very tart rhubarb pie; Mom compromised with the rhubarb-strawberry version–I’ve never come across a custard version. I also had never heard the vinegar trick. AND I didn’t know the waxed paper trick, either. I’ve always been intimidated by lattice crust and would love to see a video tutorial when you have time! Gotcha! Once I get the rest of the planting done, things should ease up a little bit around here. My Mom told me about the vinegar in the water for pie crusts. She also put an ice cube in the water to keep it extra cold. I would also be interested in seeing a video of your lattice top paper trick! Smart mom, especially in a warm kitchen. I’ll make a note of your request for a pie crust video. Could this possibly be an Order of the Eastern Star recipe? A friend gave me a similar recipe over 40 years ago and I have lost the recipe and touch with her. It was a fabulous pie. Are you out there, Diane G.? Anything is possible, although I’ve never heard of them. I haven’t tried this, but my inclination would be to keep the overall amount of fruit the same, and mix a tablespoon of cornstarch in with the sugar to absorb the extra liquid from the strawberries.